For travellers, Ho Chi Minh City (previously known as Saigon) can seem very centralized because not only are most of the tourist attractions around District 1, the center of the city, but this district is also quite compact. However, with 24 districts, the city is actually very spread out and some of the other districts are more than twice the size of District 1. Though District 1 has a lot to offer in terms of culture, sights and activities, there is a lot more to experience outside of the city. 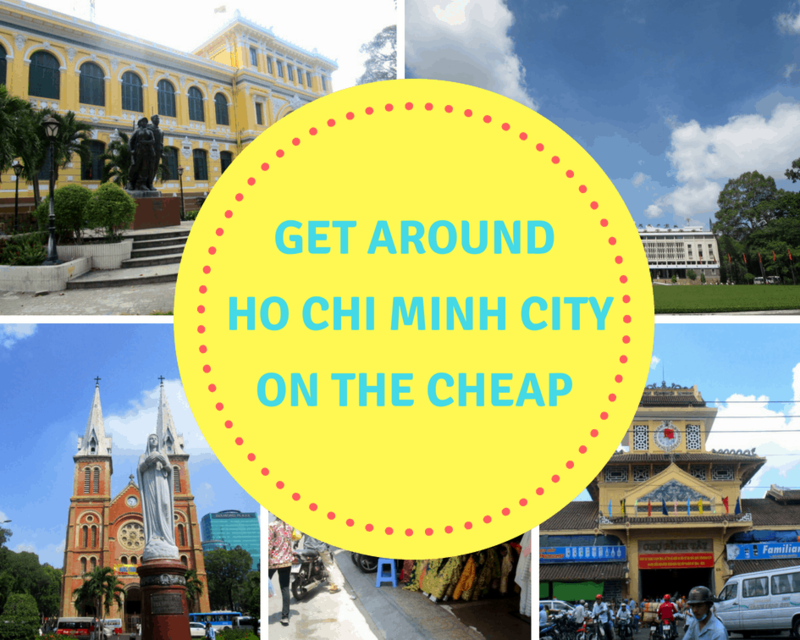 Getting to the other parts of the Ho Chi Minh City may seem challenging, but there are a number of public transportation options available to you, especially if you want to get around Ho Chi Minh city efficiently and in a cost-effective manner. The Xe Om (the local name for a motorbike taxi) is one of the most efficient modes of transport within the city. It may seem unsafe initially but most Xe Om drivers are courteous and are willing to take you wherever you want to go. Of course it is entirely possible that their driving style may be rough, but you can always tell them to slow down or be more careful. If you feel completely horrified, you can simply cut the ride short and hop off! Keep in mind though that traffic is intense in Ho Chi Minh City and a certain level of agility and aggressiveness is required to drive in the city. The prices are usually reasonable, around the range of 20,000-40,000 VND for shorter trips. Trips from D1 to the farther districts like D2 or D7 is roughly 70,000VND. It is best to take a Xe Om within the more central districts such as 1, 3, 2, 7, 4, or 5. Any farther, and the trip can be draining and more dangerous due to highway driving. Xe Om drivers may not advertise themselves clearly, but they are very easy to spot. 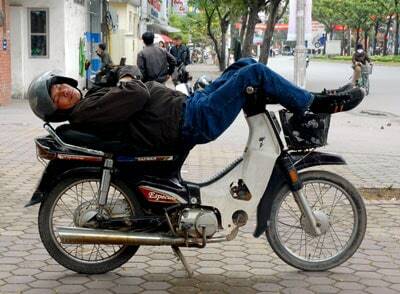 On any given street corner, you are bound to see one or two men sleeping on their motorbikes – they aren’t just lounging in the sun for fun! They are in fact waiting for someone to tap them on their shoulder and ask for a ride. Near touristy parts of town like around Ben Thanh Market, many drivers will call out to you but be careful of the price that they offer as it can be marked up significantly. Make sure to bargain the price down if you feel that their price is unreasonable. The public bus system is incredibly developed and vast in Ho Chi Minh City. There are over 100 different bus lines and routes, many of which serve the districts and tourist locations that are far from the centre of the city. The public bus is also incredibly cheap, where a single ride fare starts at 5000VND. As a tourist, taking the bus within the city can be arduous. Having to wait for the bus in the heat, and sometimes rain can be draining, especially when you can get around more quickly on a Xe Om, Taxi, or even walking. Getting to the farther destinations is a situation in which the public bus is handy. Taking the public bus is usually more appealing to the adventurous travellers, but given that Vietnamese people are usually friendly and helpful, we urge you to give it a try! It may be easier than you think. To and from the airport, bus no. 152 is very convenient. We have explained the Bus no. 152 before in our taxi scams blog, since many people fall prey to taxi scams en route to the airport and back, making this airport bus a great alternative. Bus no. 13 is another great route, which takes you to Cu Chi tunnels. As we previously mentioned on our best day trips from Saigon article, many tour buses go to Cu Chi, but Cu Chi Tunnels offers free tour guides on site so you can take the public bus there and still have a similar experience as compared to an organized tour. If you are headed to the Suoi Tien Amusement Park, you can take Bus no. 19, which leaves from Ben Thanh market and stops at the amusement park on its way to a national university. It is about a 45-minute ride, which is only a little bit longer than the car ride there. Dam Sen Water Park is also a popular tourist attraction, and Bus no. 11 goes directly from Ben Thanh market to the water park. In general, Ben Thanh market and Cho Lon are big bus hubs and it is quite convenient to get around if you can get to either market. The main Saigon Bus website also has a Google Maps based interactive guide to show you all the stops within each route. And, here is a complete, yet overwhelming, map of all the bus routes in Ho Chi Minh City. If you are looking for some day trips from Ho Chi Minh. UNESCO Can Gio Mangrove Biosphere is probably the best trip to go by bus. In 2014, Grab launched in Ho Chi Minh City, bringing a new type of transportation to Vietnam. For those who are unfamiliar with Grab, it is an online app that has changed the game for taxi services around the world. Basically, you download the Grab app, get tuned in to cars and drivers in the area on a real-time map. You put in your pickup location and destination, and the closest driver comes to pick you up! The whole ride is tracked on GPS. You can use either cash or credit card to pay for your ride and best of all, you could know how much you have to pay before using the service. The use of this modern technology for taxi rides is also making it difficult for taxi drivers to scam tourists, which has been a major issue in this city for a long time. To Grab’s advantage, Google Maps is well developed and fairly accurate in Ho Chi Minh City. The ability to pinpoint your start and end locations into Grab is incredibly useful for tourists since communication between taxi drivers who do not understand English can be an issue. And, for women especially travelling alone late at night, Grab is a much safer option. Right now, riding with Grab is cheaper than taking a taxi (except on the rush hour). For instance, a ride from District 1 to District 2 or 7 is around 100,000VND, and from District 1 to Tan Binh District is roughly 50,000VND. If you are a tourist here, take a look at our blog on cell phones to set yourself up with a local Vietnam SIM card and 3G here. Download the Grab app (available for iOS, Android), add your credit card (optional), map your location and go! In 2001, the idea of developing the Ho Chi Minh City Metro was first proposed with 6 different lines covering the greater Ho Chi Minh City area. Construction for line 1 started in 2008 and for line 2 in 2010. The first line is said to be finished in early 2020, so only a few more years until we can ride the metro in Saigon! Although it is still a ways away, the construction is affecting tourism in the city. Specifically, construction for the District 1 portions of the metro started in July 2017. As a result, large parts of Le Loi and Nguyen Hue are blocked off and traffic has become much more fierce in parts of District 1. Nevertheless, it’s an exciting time to be in Ho Chi Minh City now as many big changes are on the horizon. Hop on-Hop off is one of the very popular bus services operated in many famous cites around the world such as New York, London, Rome, Singapore, Bangkok…. In 2015, Hop on-Hop off bus was launched in Vietnam providing a new transportation for tourists to get around Ho Chi Minh City. For Ho Chi Minh City, the Line 1 Ho Chi Minh City Bus Tour will stop at 9 famous tourist attractions and historical monuments of the city. You can start your trip from any Hop on-Hop off bus stop, or at the starting stop at 23/9 park. They will provide you with the most modern buses with air-conditioning and free Wi-Fi. Moreover, while sitting on the bus, you are also provided automatic audio guides (headphone) in English, French, Chinese, Indonesian, German, Russian, Bahasa and Vietnamese. When your bus is about to arrive at each stop, the audio guide will start telling you about this stop briefly so that you can decide to get off the bus and visit this site or continue to the next point. The advantage of this bus service is that the ticket you buy could be used without limitation for 24 hours. This means that you can manage the plan for your city tour by yourself. You can stay at the tourist attraction as long as you want and then catch the next bus right from where you are. 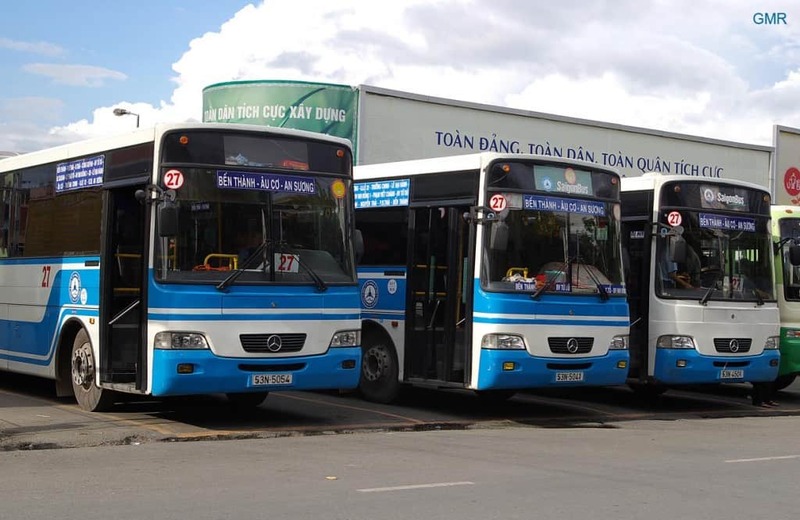 In Ho Chi Minh City, Hop on-Hop off buses operate daily from 8:00 am to 5:30 am. The buses will wait at every stop from 5 to 10 minutes to drop-off and pick-up new passengers. There is always a new bus arriving at each stop every 30 minutes. The price for one adult is VND 330.000 or around USD 15 and for one kid (age 2-12) is VND 270.000 or around USD 12. 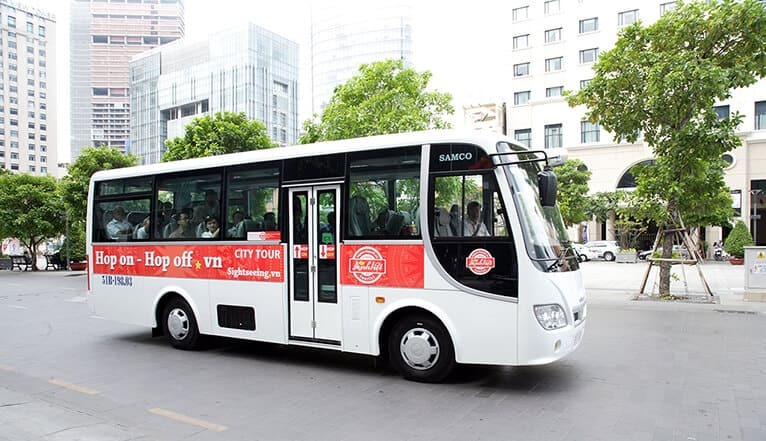 For more information about Hop on-Hop off bus please visit The Line 1 Ho Chi Minh City Bus Tour and have a good day to get around Ho Chi Minh City. At XO Tours, we strongly believe that there is a lot more to this city than just District 1. We would love to have you join us on our Foodie Tour, which is the best way to see many different districts besides District 1 and eat great street food along the way. For more Vietnam Travel Tips, check back on our Blog regularly. Very useful post — thanks. We have used google maps to give us city bus directions in many cities, and it looks as if it will work in HCM. One thing that would be useful would be to know how to use the bus — cash only? always enter in the front? where, when, and what does one pay? Those things are hard to figure out. There is no rule. Just have to go with the flow. Officially you enter through the front door and exit through the rear, but many buses that have conductors in addition to the driver will have you enter through the rear. Thank you! On Saturday using the map link, I memorized the four bus lines near my place in Bình Thạnh. I figured out where the bus stops were by watching all the buses I had barely noticed before. I entered the front, the driver doesn’t take money, and found a seat. The ticket guy came by and it cost VND6000. I returned on a different bus line. Again it was easy. A lady entered the rear door so apparently that is ok too. This bus was only VND5000 so apparently there are variations. I really have no need to rent a motorbike now as I can get all the places I need to go with a little walking. Note that I have heard that buses do not run that late but I haven’t found details yet. I would like to check how to I get to Sigon train station from Ben Thanh bus station or nearby Ben Thanh market? Note that Google Maps is missing many bus lines for some reason, so if Google tells me it will take forever to get somewhere I use Moovit, which seems to know about many more buses. This after I followed Google’s directions to get from Ben Xe Mien Dong to Cho Lon and it took an hour and a half and a transfer, and when I arrived at Cho Lon I saw there was a direct bus from Mien Dong! You can you this app to take bus easier, just select where you are and where you need to go and it will show you what bus you need to take. The local people especially student usually use this app. Hope you have a good time in Vietnam.